It is the one week anniversary of the beginning of National Novel Writing Month 2013. Three weeks to go. I am on track, and my novel word count is 12,613. I have succeeded in writing 1,667 words or more each and every day this week. And the surprise is, it wasn’t even that hard. Turns out there IS time, in every day, for a few hours of writing. I haven’t even given up any of things I consider important. I’ve gone to work, kept my room on the functioning side of clean, and maintained a social life. That’s right, a social life. Plans for a drink with a friend on Friday? Finish the word count, then go out. Social running event with friends on Saturday? Finish the word count, then go. Coffee with the boyfriend on Sunday? Bring the computer to the café, and get a start on that word count. What I haven’t been doing, or doing a lot less of, is schmutzing about on the internet and watching television. I’m actually a little disgusted with myself for not realizing earlier how simple it is to make time in my day if I set a solid goal. Why didn’t I think of this earlier, you know? Why did it take NaNo to make me realize how fungible my time is, how much of my not-really-doing-much-of-anything time could be replaced by working time. I hope… well, I am wary of making sweeping statements because I have a great deal of difficulty sticking with any new routine or way of living beyond the first week or two, but I hope that when NaNo is over, I will remember how simple it is to find time in the day to work, and I hope I will apply that to all my other long term projects and goals. Also, it’s not all smooth-sailing. 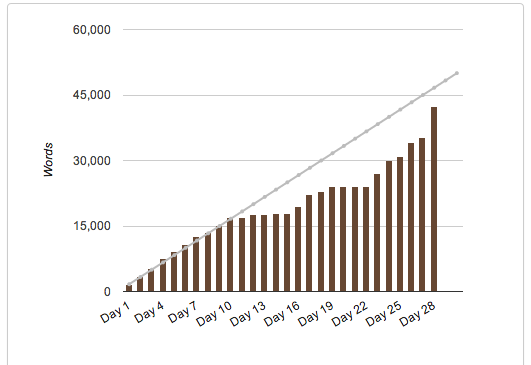 We’re at week one, and my NaNo Novel is on the rocks. I really like what’s going on with the characters, and I like how it’s all developing, but at 12,000 words it’s hard to keep writing without knowing a few things about, you know, the plot. What is the super-secret evil mastermind goal of my villain? What’s he doing it all for? How is Cor going to stop him, and what is Cor saving him from? I’m hoping I’ll have a revelation while I’m driving the bus today. And then I’m going to have to try to make my wordcount in the car or something, because Mr. Huntington (the BF, and a very handsome fellow) and I are traveling to my folk’s house this evening to stay for a few days. Which, by the way, I only have about an hour to pack for before I have to go to work, and Friday is one of those days at work where they ought to just give me a time-traveling bus already, and perhaps an extra dimension in which to eat lunch. So anyway, there’s your update. Can I power through the plot void and stay on track with my NaNo Novel, or will this be the weekend my word count falters? Stay tuned.